MANILA, Philippines - Malacañang Palace through Proclamation No. 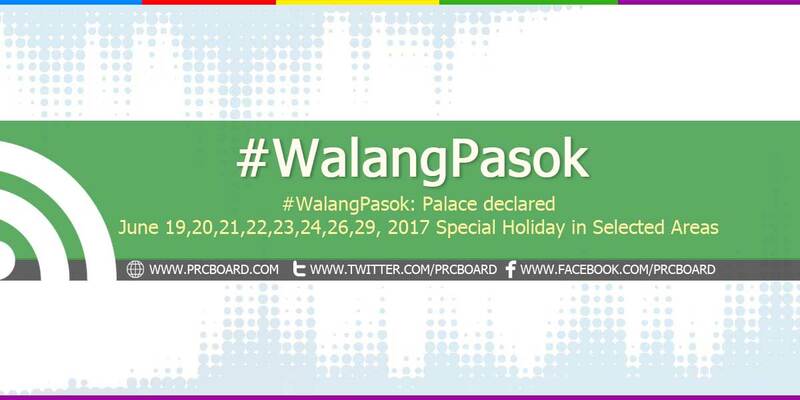 208 through 235 series of 2017 declared June 19,20,21,22,23,24,26,29, 2017 as special non-working days at selected areas due to celebrations of various important events. Special non-working holidays are specifically declared on the following dates for their celebration of respective important occasions. Proclamation No. 208 - Special non-working day in the City of Manila on June 24, 2017 (Saturday) for the celebration of its 446th Foundation Day. Proclamation No. 209 - Special non-working day in the Municipality of Molave, Zamboanga del Sur on June 16, 2017 (Friday) for the celebration of its 69th Founding Anniversary. Proclamation No. 210 - Special non-working day in the City of Bogo, Province of Cebu on June 16, 2017 (Friday) for the celebration of its Charter Day. Proclamation No. 211 - Special non-working day in the Municipality of Laurel, Province of Batangas on June 21, 2017 (Wednesday) for the celebration of its Founding Anniversary. Proclamation No. 212- Special non-working day in the Province of Agusan del Sur on June 17, 2017 (Saturday) for the celebration of its 50th Founding Anniversary. Proclamation No. 213 - Special non-working day in the Province of Ifugao on June 19, 2017 (Monday) for the celebration of its Foundation Day. Proclamation No. 214 - Special non-working day in the Municipality of Maasim, Province of Sarangani on June 21, 2017 (Wednesday) for the celebration of its 48th Founding Anniversary and 9th "Kestebeng" Festival. Proclamation No. 215 - Special non-working day in the Municipality of Rosario, Province of Agusan del Sur on June 21, 2017 (Wednesday) for the celebration of its "Yagi-Yagi" Festival of Native Cultural Heritage. Proclamation No. 218 - Special non-working day in the City of Tabaco, Province of Albay on June 24, 2017 (Saturday) for the celebration of its "Tabak" Festival. Proclamation No. 219 - Special non-working day in the City of Dagupan on June 20, 2017 (Tuesday) for the celebration of its 70th Charter Anniversary. Proclamation No. 220 - Special non-working day in the City of Batac, Province of Ilocos Norte on June 23, 2017 (Friday) for the celebration of its 10th Charter Day. Proclamation No. 222 - Special non-working day in the Province of Laguna on June 19, 2017 (Monday) for the celebration of 156th birth anniversary of Dr. Jose Rizal, Philippines' national hero. Proclamation No. 223- Special non-working day in the City of Calamba on June 19, 2017 (Monday) for the celebration of its 156th birth anniversary of Dr. Jose Rizal and "Buhayani" Festival (Buhay ng Bayani, Buhay na Bayani). Proclamation No. 224 - Special non-working day in the City of Lipa, Batangas on June 20, 2017 (Tuesday) for the celebration of its 70th Founding Anniversary. Proclamation No. 225 - Special non-working day in the City of Coronadal, Province of Cotabato on June 29, 2017 (Thursday) for the celebration of Tree Growing Festival. Proclamation No. 226 - Special non-working day in the City of Laoag, Province of Ilocos Norte on June 19, 2017 (Monday) for the celebration of its Charter Day. Proclamation No. 227 - Special non-working day in the City of Bayugan, Province of Agusan del Sur on June 21, 2017 (Wednesday) for the celebration of its 10th Charter Day. Proclamation No. 228 - Special non-working day in the City of Pagadian, Province of Zamboanga del Sur on June 22, 2017 (Thursday) for the celebration of its 48th Charter Day. Proclamation No. 229 - Special non-working day in the City of Tandag, Surigao del Sur on June 23, 2017 (Friday) for the celebration of its Charter Day. Proclamation No. 230 - Special non-working day in the Municipality of Rosario, Batangas on June 9, 2017 (Friday) for the celebration of its Founding Anniversary. Proclamation No. 231 - Special non-working day in the Municipality of Pamplona, Negros Oriental on June 16, 2017 for the celebration of its 67th Founding Anniversary. Proclamation No. 233 - Special non-working day in the City of Angeles, Pampanga on June 15, 2017 (Thursday) for the remembrance of the 2nd largest volcanic eruption in the 20th century occurred in Mount Pinatubo, Zambales. Proclamation No. 234 - Special non-working day in the Municipality of La Trinidad, Province of Benguet on June 16, 2017 (Friday) for the celebration of its 67th Founding Anniversary. Proclamation No. 235 - Regular Holiday throughout the country on June 26, 2017 for the celebration of its Eid'l Fitr (Feast of Ramadhan). Meanwhile, below is the table summary of upcoming special non-working holidays for the month of June 2017, courtesy of gov.ph proclamations. To receive updates on upcoming holidays, we advise our visitors to visit gov.ph official website or follow us at our social media accounts via Facebook and Twitter.